But what most retail store owners forget is that the layout of their store is vital, and directly related, to the rate of sales. Is a Grid, Loop, or Free-Flow Layout Best for Your Store? As you can imagine, your store has endless layout possibilities. Your industry and product(s) will dictate the type of layout that is optimal for your business. 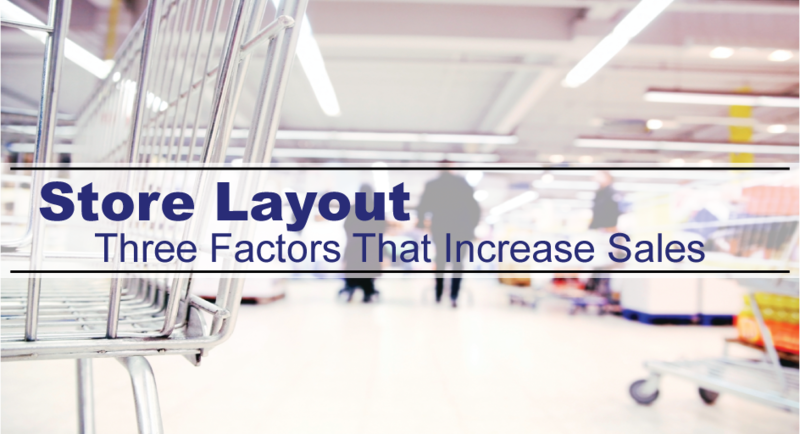 Grid layouts are commonly found in grocery stores, convenience stores, pharmacies, and similar businesses. This layout is easy for consumers to navigate up and down each aisle, find the item they are looking for and complete their shopping in a quick amount of time. A large benefit to the grid layout is the ability to boast features at the end of each aisle, such as discounted products. Loop layouts include a predetermined “track” or main aisle that circles around the store. These layout styles allow customers to walk around the perimeter of the store and see all of the available products. Big Box stores such as Target tend to utilize this layout to gain maximum exposure for every type of product. No matter which direction you walk, you’ll be near the perimeter of their store. Lastly, free-flow layouts are exactly as they sound. Many specialty retailers are drawn to this layout style because of the freedom and creativity involved. Customers can walk in any direction they please, check out various types of products, and even find something they might not have been looking for originally. Many business owners note an increase in impulse sales when using the free-flow store layout. When you enter a store, do you often take note of the immediate appearance? No, of course not. You are focused on finding the item you need. While you may not consciously notice the appearance of the entrance or exit, their design still matters. Your storefront, including the immediate entrance, must be captivating. Otherwise, customers will not want to go inside — even if they cannot figure out why. You could have the world’s best interior design, layout and displays, but if no one walks through the door, what does it matter? It seems trivial to obsess over the location of shopping carts and baskets in a store. However, it is crucial. Imagine walking into a store and having to immediately search for a basket or cart. Frustrating, right? The first five to fifteen feet inside your front door is known as the “Decompression Zone”. Here, customers are transitioning into the store, forgetting about the parking lot, the outdoors, and whatever happened moments before. They are now zoned in on shopping. Due to their focus or distraction, whichever they experience, this area is not ideal for carts, baskets, or special discounts. Place your shopping carts and baskets inside your store, just outside of the decompression zone and in plain sight, so customers can find them easily and begin their shopping experience. You know just how important shopping carts and baskets can be to the overall customer experience. Take a look at your current set of carts or baskets? Are they broken down? Old? Frustrating to use? If your answer to each was an overwhelming “YES!”, then it’s time to order your new set of shopping carts and baskets from Good L Corporation today. Good L Corporation delivers innovative shopping cart and basket solutions for retailers on a global scale. From a fleet of new custom carts to launch your store opening to replacement baskets that supplement your existing shop supply, Good L Corp can configure the right carryall strategy to boost your retail business. Let’s get started! Contact us today for a no-pressure sales quote. Get a boost to your impulse sales which ultimately leads to an overall improvement of your total sales. Don’t you want to increase sales? Of course you do!